At long last, Bittersweet Flight is here! This is my long-promised follow-up novel to A Suitable Young Man. I’d originally hoped to be able to produce it by December of last year, making it exactly a year after the release of my first novel. Unfortunately, because of various health problems, this deadline became impossible to meet. After much fine tuning and editing, it is available for pre-order from Amazon UK (and I assume from other Amazon stores) from Tuesday, 1st March. So what’s this one about then? It’s a touching tale of self-discovery, family, loss and love set in a Lancashire mill town in the 1950s. It’s 1956 and Sally Simcox is a girl in trouble, at a time when having an illegitimate child is considered shameful. The father, Nick Roberts, had offered to marry her but, knowing he was in love with someone else, she’d told him she’d had a miscarriage. Sally has fled to the anonymity of Blackpool, not knowing what she’s going to do there or how she will cope with her situation. 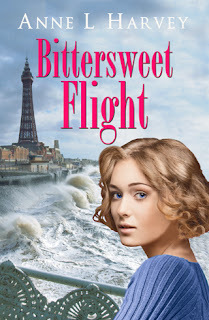 On the day of her arrival in Blackpool, she meets a young RAF serviceman. He seems familiar and it isn’t long before Sally realises that he’s the last person she needs to meet for he is Nick’s younger brother, Phil. And he has no idea who she is. Yet it seems that their paths are destined to cross. To tempt your reading appetite, an excerpt from Chapter 1 follows. Today should have been her wedding day. A sense of desolation swept over Sally Simcox, causing her to falter as she stepped off the train on to the platform of Blackpool Central station. She stood for a moment, gathering courage, aware that her solitude marked her out from her fellow passengers, who were either in family groups or gangs of lads and lasses. Conscious that several of the lads were eyeing her up, she automatically straightened her spine, hoping someone would offer to give her a hand. When no-one did, she shrugged her shoulders and leaned to the side to compensate for the weight of her suitcase. She staggered onto the main concourse of the station, amid all the hustle of a normal Saturday, mostly day trippers at this time of year, come for the famous Illuminations. Fighting clear of the crowds, she made her way to the exit and on to the street beyond where she stopped to take in this first sight of her beloved Blackpool. She put her case on the ground the better to absorb the sights, the sounds, the smells. The Tower soared up, gigantic at such close quarters. To her left was the grey choppy expanse of the sea. Its sharp saltiness, the sweetness of candyfloss from a nearby rock stall filled her nostrils as she breathed in. For the first time in several days, she felt the stirring of anticipation and excitement. She was in Blackpool and at the beginning of a new life without her family. Being here was either a gamble or, as her brother, Jud, had said, ‘a bloody stupid idea.’ Gently, she put both hands on her belly in a protective gesture. ‘This is it, kid. It’s you and me against the world’. From behind, someone barged into her and she landed with a thump on the pavement, where she lay winded. She glanced up in time to see a group of blue-uniformed RAF boys, laughing and jostling each other, eager to be at the delights of the busy seaside town. ‘You clumsy clots!’ she yelled after them, uselessly as it turned out for they were oblivious to anyone but themselves. Then she felt a hand under her elbow and a voice said in her right ear. ‘Are you all right? Do you think you might have broken owt?’ The familiar Lancashire accent was reassuring. ‘No, I don’t think so,’ she said as, with help from her rescuer, she rose to her feet. Her suitcase had burst open and to her horror, her far-from-white underwear lay exposed to the world. ‘Oh, no!’ she said, inwardly cursing her mother’s laziness at not separating the whites from everything else when doing the washing, no matter how many times Sally reminded her. She gathered her belongings up, shoved them out of sight and snapped the case shut again. She shouldn’t; she didn’t know him. On the other hand, she did feel shaky and there was the baby to think of. ‘Thanks. But what about your mates?’ She nodded in the direction the other RAF servicemen had gone. He laughed. ‘They’re not my mates. They were probably erks – National Servicemen – on their first pass after being on an armament course at Kirkham.’ He picked up her suitcase with ease and indicated that they should turn right. ‘I’m based at Kirkham too, only I’m a regular.’ The lift of his muscular shoulders showed his obvious pride. He led the way down Central Drive until they came to a brightly lit café. From a juke box came the sounds of Elvis Presley’s ‘Don’t Be Cruel.’ Leaving her sitting at one of the formica-topped tables, the young serviceman went up to the counter where he chatted to the proprietor. He’d taken his cap off as they’d arrived, revealing fair hair ridged where the cap had rested. His manner seemed affable and easy-going, though he would never stand out from the crowd in the way Nick had done. A sharp pang of pain shot through her as she thought of Nick, lost to her now. Occasionally, she doubted the wisdom of passing up the chance of marrying him but the decision had been hers alone and she must live with the consequences. And she could never go back because she’d told her family – and Nick – that she’d had a miscarriage. As he said that, the vague familiarity that had been troubling her since he’d first helped her to her feet, clarified in her mind and a sick feeling spread to her stomach. Improbable though it might seem, this personable young man was Nick’s younger brother. The link to pre-order is here http://www.amazon.co.uk/dp/B01CBTQH54.